I've been doing so much deep sky imaging over the last few years that I've neglected the solar system for almost three years! Last night I decided to do something about that and went out and imaged Jupiter. One of the problems I'd had when planetary imaging was getting the mechanics of it to flow smoothly. My polar alignment was never good enough, causing targets to drift and making it tough to use region of interest (ROI) imaging. ROI imaging lets you use a small portion of your sensor and get higher frame rates. For example, my Point Grey Research Chameleon gives only 15 frames per second (fps) at its full resolution. When that's reduced to 640 by 480 pixels it provides 24fps, and further narrowing of the ROI can get it up to 30fps. One way around polar alignment problems is to use autoguiding. To make autoguiding work in this way you need to have a rough alignment (and I do mean rough: north and level is good enough unless you want to use very long focal lengths.) You also want to use the planet as your guide star. Doing so causes the rotation due to rough polar alignment to be around the planet's center. This keeps it fairly minimal over the time span of most captures. Lack of experience using AS! 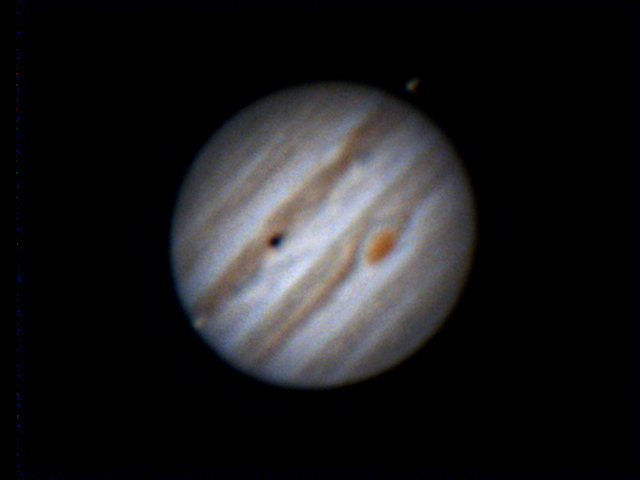 Despite these problems it was good to get a not-awful image. What pleases me most about this image is the natural color it has without the need for any tweaking. Back in the old days of using my TouCam colors never seemed quite right.